To reach the summit of customer experience, financial services organizations have many paths up the mountain. Whether through employee-staffed call centers or mobile technologies; novel promotions or choreographed channels, banks have myriad ways to give customers what they want. But aside from the lofty destination, much centers on the journey itself. Sometimes that means stepping up the tech game; others it calls for rethinking the placement and potential intrusion of human touchpoints. No matter the variable, it's safe to say the ground has shifted significantly from several years ago, when high-tech played more of a bit part in making customer experience shine. And yet, no shiny new tech toy holds the answer. 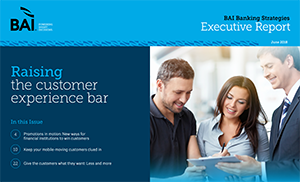 This executive report gets to the heart of finding the right mix to ensure your customer experience success. Passive gift giving has given way to interactivity, with parties, yoga classes and hotlines to the CEO as part of the new wave. Outstanding mobile banking tools are key to attracting and keeping customers. Just don’t leave your customers in the dark. For all its parts and departments, online conversion depends on skilled people on the call center front lines.